Updated Feb. 24: The research courtyard and the Auditorium parking lot will close starting Saturday, March 1 and continuing until Monday, March 17. Buildings on the courtyard will still have access through indoor routes; Auditorium Lot parking will move to level 3 of the Sam Jackson Garage. The closures will allow staging, operation and removal of a large crane for lifting components needed in the project to replace Richard Jones Hall cooling equipment. The work will improve reliability and cooling capacity in research buildings during the warm months. The closures were postponed from original February dates after a manufacturer delayed delivery of a crucial piece of equipment for additional quality assurance. During the closure, please use the Richard Jones Hall building entrance just to the right of the large half-head sculpture (see the aerial photo below) to reach other courtyard buildings. 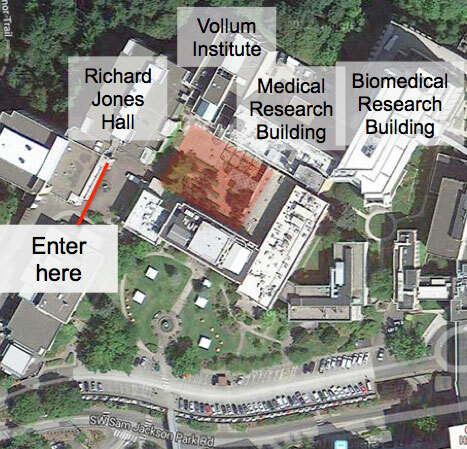 A contiguous route exists from Richard Jones Hall level 5 to Vollum Institute level 2M and then to Medical Research Building level 3, which connects to the third levels of the Biomedical Research Building and Mackenzie Hall. Those on record as residing in Richard Jones Hall, the Vollum Institute, the Medical Research Building and the Biomedical Research Building have ID-badge access at the entrance specified above. ID-badge entry is necessary before 6 a.m. and after 8 p.m. on weekdays, and at all hours on weekends. The work is purposely scheduled for winter to avoid disrupting the building’s cooling capacity, thus helping to protect your important work. But a winter crane lift is more likely to be postponed by weather. Your patience may be taxed, but will be hugely appreciated. 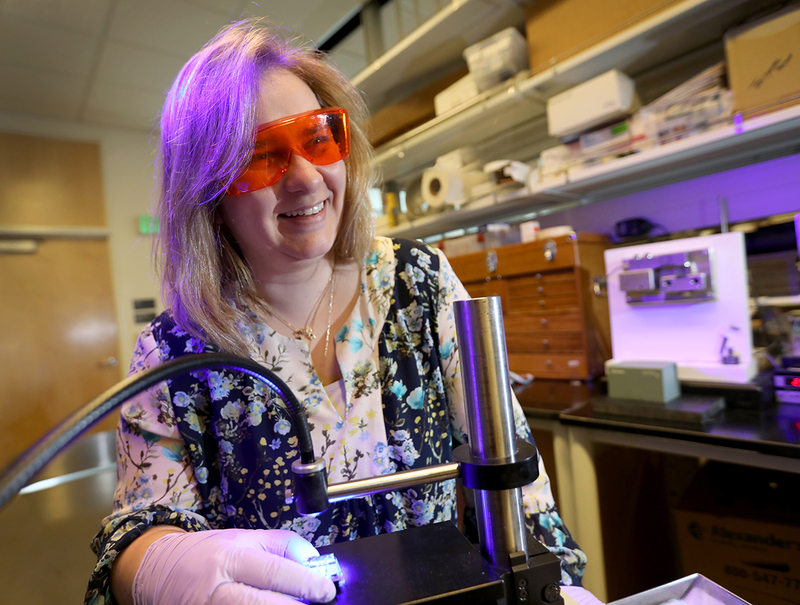 Work performed this winter and next will improve reliability and cooling capacity in research buildings during the warm months. When the Auditorium Lot’s 3-Diamond parking spaces move to the third level of the Sam Jackson Garage (across Sam Jackson Park Road from the Emergency Dept. ), that level’s patient parking will move to the first level as well as to Physicians Pavilion and/or Kohler Pavilion, as needed. To head off patient-parking stress elsewhere, Transportation & Parking is introducing some downstream relief: patient valet parking at Doernbecher Children’s Hospital. If you work in Richard Jones Hall, watch in mid-February for specific direction from Public Safety and/or contractor staff during actual crane lifts. The top floor will be evacuated as a precaution for a few minutes during each lift. Contribute your questions and concerns on the Bridge collaborative site for the project. It includes a discussion area and archive. If you are having trouble accessing the Bridge site, contact Bill Walters. bf smoody: That’s before my time here, but could very well be. This upcoming crane lift is to replace large cooling equipment located in the basement rather than on top. It’s original and even appears to predate the building, having been moved in from another site.